It is no wonder that architect Richard Rogers is feeling a bit peeved at Prince Charles. This month, the heir to the British throne scuppered plans for a £1 billion development putting 552 apartments on the 12.8-acre site of the old Chelsea Barracks. Rogers was most offended that the Prince used his Royalty to by-pass the usual planning law consultation, by speaking direct to the Qatari royalty who owned the site. This is not the first time the heir to the throne has acted as Lord High Planner. Twenty five years ago, he threw a hissy fit about a modernist, hi-tech tower development planned on the national gallery. It was created by the firm Ahrends, Burton and Koralek – but inspired by a Rogers’ design. His sub-majesty called it a ‘monstrous carbuncle’ on the face of a much loved and elegant friend (his ancestor predecessor William IV had a lower opinion of William Wilkins late classical design – ‘a nasty pokey little hole’). He got his way, then, and a pseudo-classical outgrowth was manufactured by Robert Venturi. Just a month ago, Charles was asked back to the Royal Institute of British Architects, where he first made the ‘carbuncle’ attack, and even apologised, half-jokingly, promising not to set off another debate about modernist versus traditional architecture. But word had already got out that he was going to sabotage the Chelsea Barracks development. Charles’ has been dogged, or perhaps the word is better dogmatic, in his interest in architecture and planning. Out in Dorchester, on land owned by the Duchy of Lancaster (that’s Prince Charles, to you and me) he constructed a weird dreamscape of a village called Poundbury, wholly built according to the Prince’s own ideals, of tradition, community and high density dwellings, designed by the new urbanist Leon Krier. It is full of desperately traditional motifs, like a film set, and it is supposed to be built to dissuade car use (though according to a recent survey, resident are above average car users). Richard Rogers has dared break ranks with the Prince publicly over his busy bodying. Rogers makes some excellent points. The Prince is but a man, amongst many: why should he have more say so than anyone else? The Prince will not debate his views, so why should he be allowed this influence on political choices? Even moderate constitutionalists agree that the Royalty enjoys its formal position as head of state (which Charles will become, if his mother Queen Elizabeth dies) on the condition that they keep out of day-to-day politics. One person who put some real flesh on the bones of Rogers’ complaints has been Vicky Richardson, the editor of the architecture magazine Blueprint. When Charles stood to address the Royal Institute of British Architects, she shouted out ‘abolish the monarchy’, a cry that was perhaps a bit too plebeian for Richard Rogers. Rogers is the last person to be telling us that we should not fawn to established authority. Let me spell it out for you. This is no plebe; it’s Sir Richard Rogers, Baron Rogers of Riverside, a peer of the realm. In 1991, Rogers, in an act of fealty, bent down on one knee before the Queen, to be made a knight. In 1996, he was made a Baron, and sits in the unelected House of Lords (on the Labour benches). Quite why Rogers thinks he is free of the oaths he made to protect the Queen – and consequently her progeny – is not clear. Richard Rogers’ leaning on the Royal brand when it suits him is not the end of his fixation with authority over the common people. Though he pressed a few demotic buttons when he turned on Prince Charles, there was a weird undercurrent of superiority in his complaints. Prince Charles is not an expert he was keen to say. Charles has no expertise in architecture … unlike Richard Rogers. It was quite a snooty put down to place on a soon-to-be King. Rogers went further, asking whether things ought to be changed, so that the unspoken rule that the monarchy stay out of everyday politics might be shored up. Indeed, Richard Rogers called for a panel of constitutional experts to re-examine the Prince’s powers. ‘A panel of constitutional experts’? Who are these ‘experts’ that know better than the rest of us how the United Kingdom ought to be run? A committee of the House of Lords, perhaps? At the heart of Richard Rogers case against the monarchy is not an argument for the people against entrenched authority. Rather, it is an argument for a new elite to take over – ‘experts’ (so-called), technocrats, people like Rogers himself, who know better than the rest of us how we should live. In real fact, Rogers may be even more a throwback to medievalism than the Prince. 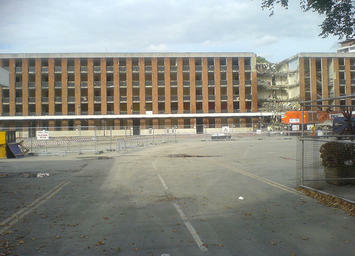 Rogers’s Chelsea Barracks development has been attacked for being too ‘modern’. But the row is cast in terms of traditional versus modern, because in many ways, Rogers plans are more backward looking that Charles’s. One feature that lies behind the many complaints that preceded Charles’ intervention is the density of the development. Originally planned for 638 flats, the developers were persuaded to reduce the number and increase the open space from two to 6.2 acres. Local people resent more bodies being crammed into an already overcrowded, teeming and increasingly dehumanized London. In this process, Rogers is far more a villain than the unlikable Prince. In 1998 his government appointed Urban Task Force saddled planning authorities with the principle that most new development would take place on ‘brownfield’, that is previously built-upon land, not newer greenfield sites out in the country. This is almost something out of apartheid or the 19th Century enclosure acts. The policy is to keep Londoners kettled up behind the Green Belt, telling local authorities to keep filling in every patch of land that becomes available with extra housing, densifying the city. Ironically, the Prince entirely agrees with Rogers on the need for densification – but at least he prefers something more humane, like a nice cottagey feel, and some old stonework. The ‘urban nimbys’ who objected to the Chelsea barrack development are a new thing. In north London, residents protested against an apartment block squeezed into a space that used to be garages at Pilgrims Way. Under the regional plan, drawn up on rules laid out by Baron Rogers, local objections have no purchase, because the overriding goal is cramming: forcing ever more people in a fixed amount of space. That is why Rogers is so angry with the Prince. Rogers has the planning approval all sewn up. Because his development offers the highest density, it ticks all the right boxes as far as the planners are concerned. But for residents, looking at results of cramming on their already limited space, 500 new flats squeezed in does not look so good. They have a right to object, but the plan – blessed by the experts, knighted and not – trumps their objections. Rogers objects that the Prince is using his hereditary power. But what makes Rogers so cross is that he is accustomed to exercising unchecked and undemocratic power to get his own way. He cannot quite believe that there might be a greater unelected power in the land than his own. The fact is the so-called great are only great because we are on our knees, said the Irish rebel James Connolly. It is time the British stood up and kicked both of these unelected overlords out, whether to the manor born or entitled by their “expertise”.